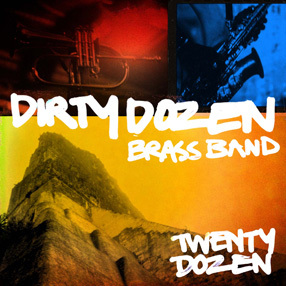 Born under the auspices of the Dirty Dozen Social and Pleasure Club in 1977, the Dirty Dozen Brass Band are a seven member ensemble who started out as the house band and eventually broke through the boundaries of the traditional brass band to evolve into a highly lauded world-renowned musical force. With several incarnations throughout the years, the band now consists of Gregory Davis (trumpet, vocals), Roger Lewis (baritone, soprano sax), Kevin Harris (tenor saxophone), Efrem Towns (trumpet, flugelhorn), Kirk Joseph (sousaphone), Terence Higgins (drums) and Kyle Roussel (keyboard). Former member Jake Eckert (guitar) is featured throughout TWENTY DOZEN.